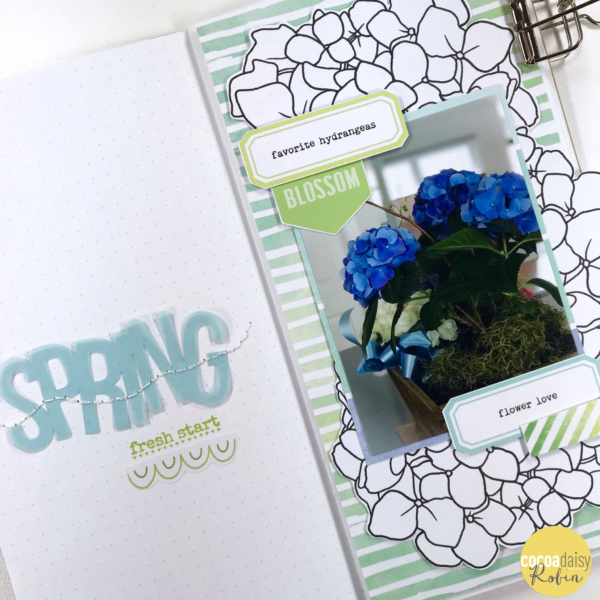 Today I am sharing a design in my Picket Fence Simple Dori from the Traveler’s Notebook memory keeping kit. First I wanted to show you how I sewed my title to the left side of my design. 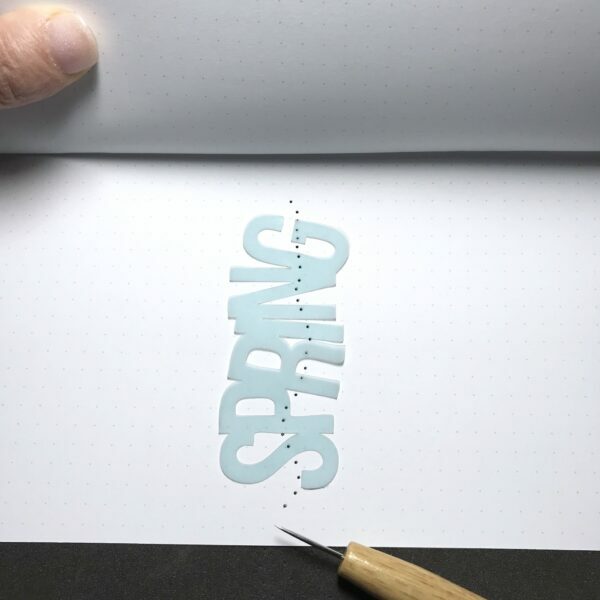 I placed my vellum “spring” phrase and used a pencil to lightly mark the spot. Then I carefully folded my notebook to ensure only the left page laid flat on my paper piercing pad. I placed the vellum title between my pencil marks and pierced a pattern free hand in a whimsical flow. Next, I hand sewed the title to my page. One hint I would like to give you is after you complete your piercing pattern, do not move the vellum. 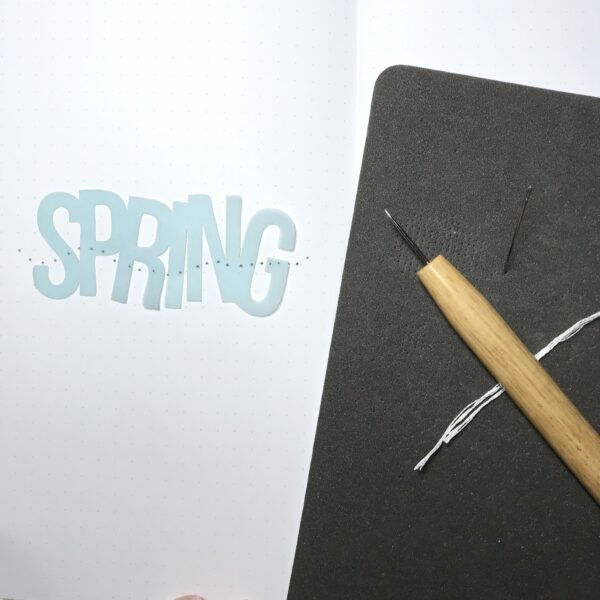 It is actually held in place on your notebook page by the pierced design which make it a breeze to stitch onto your paper. On the opposite side of the stitched title page I used washi tape to keep my thread ends in place. 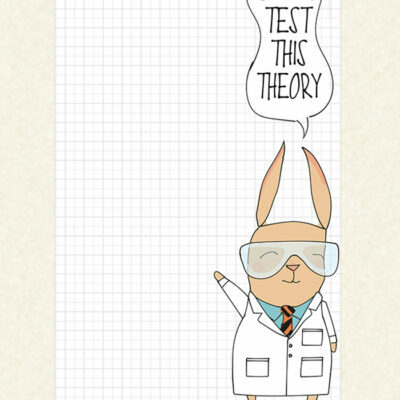 When I create a design for this page I will replace the washi with double sided red tape to keep the my stiches in place. 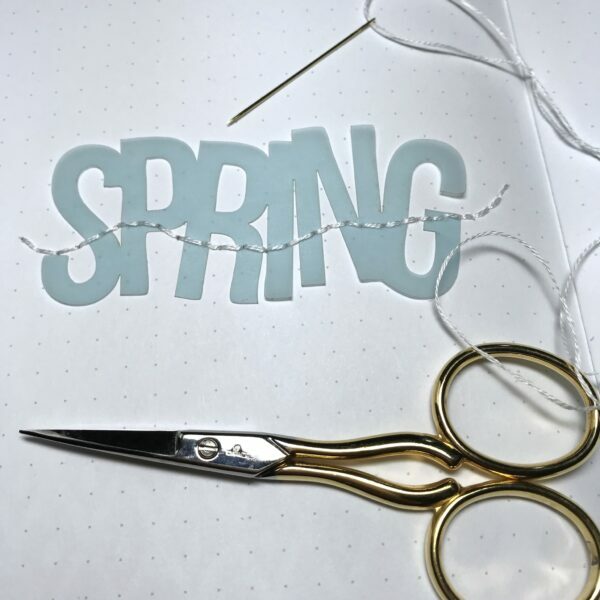 Using the double sided tape will also ensure the paper or photo I place on the page to hide the thread provides another layer of protection for my hand stitching. 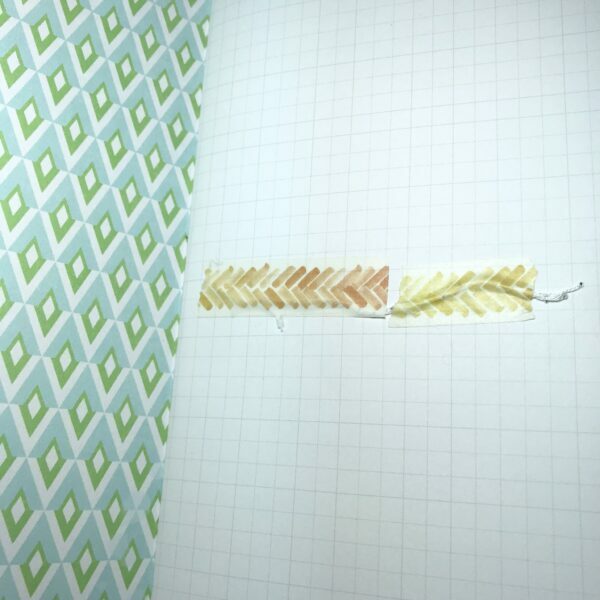 After I finished the stitching, I began playing with pieces from the Memory Keeping kits and the coordinating printable. I am sharing a couple of the configurations I considered below. Next lets walk through the configuration and embellishments I chose to create my final design. I decided I wanted to keep my title page simple to show off that beautiful vellum phrase! The ink that comes with the traveler’s notebook kit is a beautiful shade of green and after a couple of test stamps, I decided I wanted to include a stamped phrase with the ink in my layout. 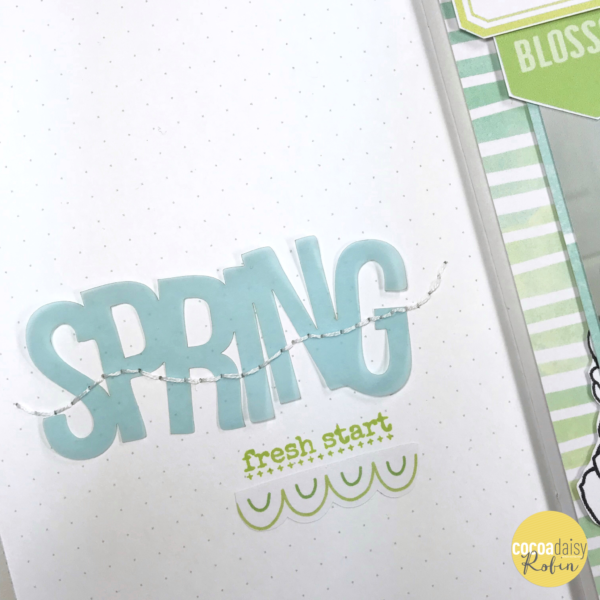 To finish off the title I chose a border sticker from the pocket kit and cut it down to fit under the length of the stamped phrase. 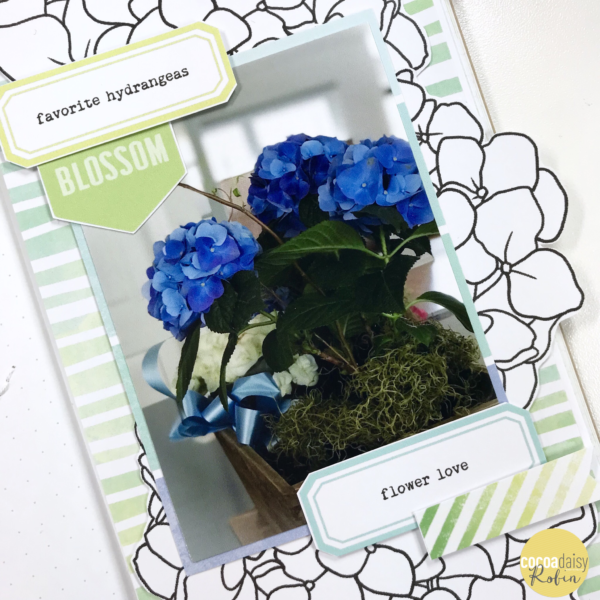 I sized and then printed a digital hydrangea stamp I had in my digital stash then fussy cut it to add behind my photo. 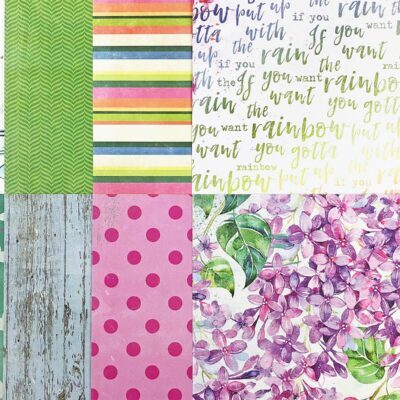 After playing with a few different papers from the planner and memory keeping kits I loved the look of the paper as a background and chose one from the planner kit papers. 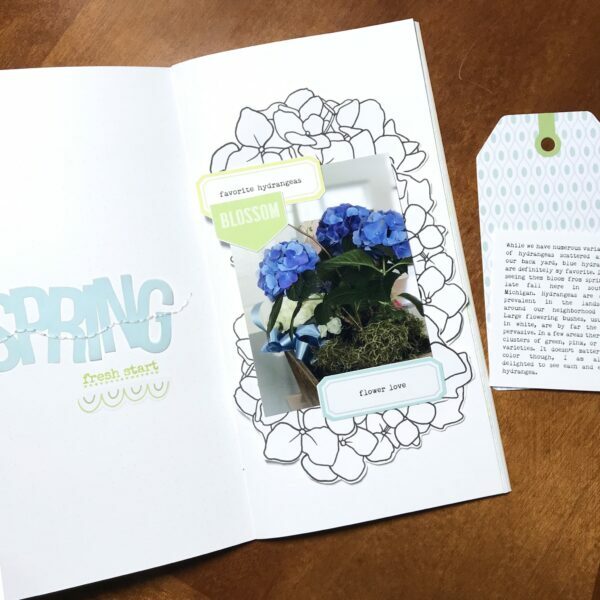 I added tags and ephemera from the printable to my photo in place of the typed journaling I was considering. 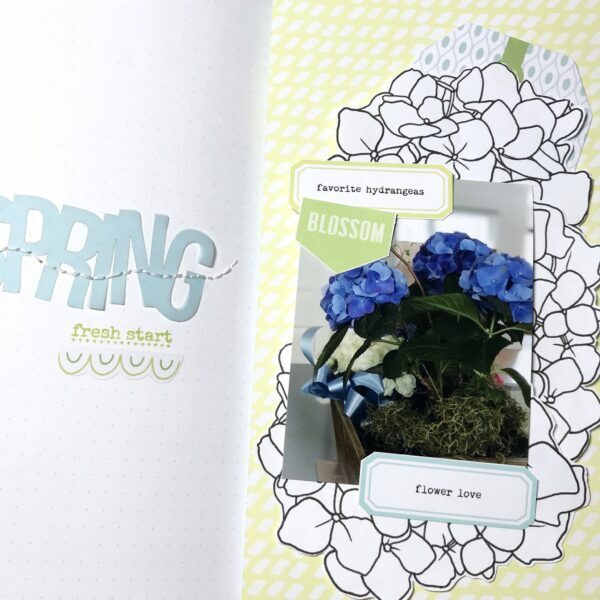 I am very happy with the design and I hope I was able to give you a few tips or ideas to incorporate in your scrapbook and planner designs. The Picket Fence kits are gorgeous and the blues Christine incorporated make the kits my absolute personal favorite this year. 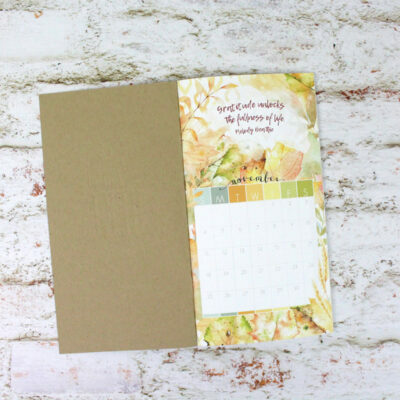 I encourage you to share your scrapbook and planner designs with us on the private Cocoa Daisy Facebook groups so that we can ooh and ahh over them and show you some love.